It is my attempt in this piece to defend, to the best of my abilities, the long-held Christian doctrine of the Trinity in a logical and Biblical manner. First off, let us get out definitions right. Within the unity and nature of the one God, there are three persons, Father, Son, and Holy Spirit… That is the Christian concept of the Trinity. There are not three Gods, or two, but one and only one, who happens to reveal Himself to us in this triune manner. Also note, I am not here to defend the word “trinity” per se but the doctrine of the Trinity. It is true that the word itself is a post-Biblical invention of later scholars who needed a term to describe the clear concept that emerged to them when they studied the Scriptures… and if the term bothers you, by all means substitute in whatever term makes you feel more comfortable while reading this. Now it is my proposition, that if I can demonstrate that there are really three distinct personages spoken of in the Bible who are all separately referred to as God, and then if I can demonstrate clearly that the Bible also teaches that there is only one God, not two, or three, or any other number, then the only conclusions that can be reached in the end is that either the Bible contradicts itself, and should no longer be trusted for anything whatsoever, or that there is a bigger issue here that we need to step back and take a look at in its totality, to grasp competently. And after doing this, I propose that that in the end, we will be able to come the same logical mathematical conclusion that states that things that are equal to the same thing, are also equal to each other and therefore these three persons, even though they are each distinct from one another in certain aspects are all still a part of the same basic singularity that we refer to as God. Fair enough? Now one key thing to remember is to always interpret the Old Testament in light of the New Testament, and never the opposite way around, because it is in the New Testament that every single part of the Old Testament finds its ultimate fulfillment. Indeed the New Testament is in the Old Testament concealed, but the Old Testament is in the New Testament revealed. So with that established, I will stick primarily to the New Testament scriptures that effect this doctrine in some way, while occasionally pointing back to an Old Testament Scripture when it can be fully clarified in light of the New Testament perspective. 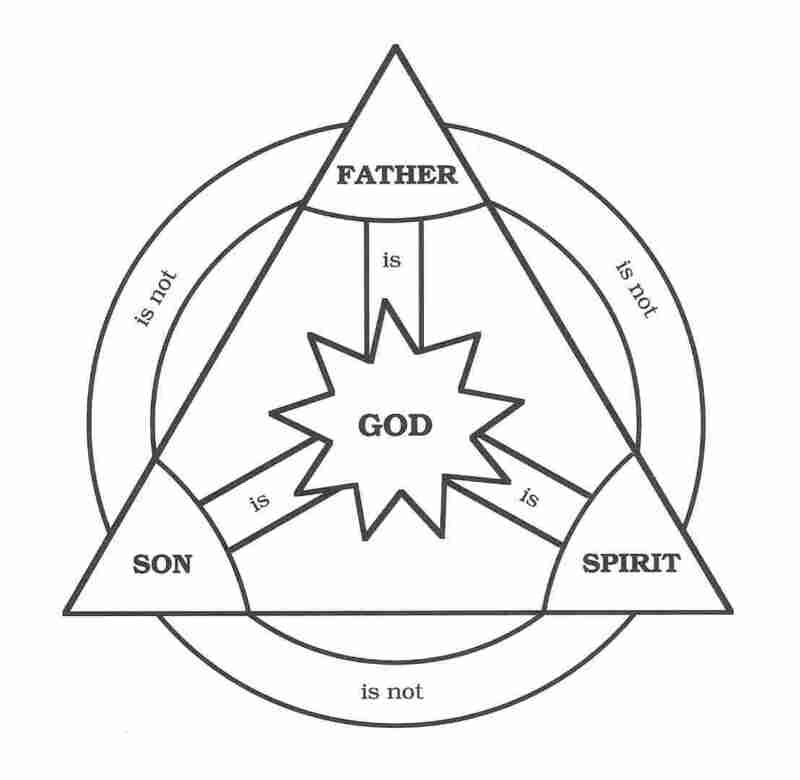 So with that said, let us begin with the verses detailing the three persons of the trinity. For he (Note: Jesus Christ) received from God the Father honour and glory, when there came such a voice to him from the excellent glory, This is my beloved Son, in whom I am well pleased. Now we have proven two things from this verse. One, that there is a person called the Father, and that He is here in the Bible identified as God. And secondly, there is also a person called the Son. Now the next thing is to show that the Son is also called God. Thus saith the LORD (Note: Jehovah) the King of Israel, and his redeemer the LORD of hosts; I [am] the first, and I [am] the last; and beside me [there is] no God. And, behold, I come quickly; and my reward [is] with me, to give every man according as his work shall be. I am Alpha and Omega, the beginning and the end, the first and the last. There is no other person that the phrase Alpha and Omega (first and the last) can be referring to than God himself. No one else is from eternity to eternity. So here in and we have established beyond any shadow of a doubt that this phrase is indicative of the one and only God and can only be referring to God and God alone. Even the Jehovah’s Witnesses cultists who deny the Trinity and the divinity of Christ won’t debate you on that point. What I suspect they might have trouble with though, is the following… from the very same book! And when I saw him (Note: Jesus), I fell at his feet as dead. And he laid his right hand upon me, saying unto me, Fear not; I am the first and the last: I [am] he that liveth, and was dead; and, behold, I am alive for evermore, Amen; and have the keys of hell and of death. And now here we have in this chapter, Christ himself, speaking to John using this title that we have already shown is only to be used of God himself as God alone is able to say of Himself that He is the first and the last… and it is impossible for there to be more than one first, or more than one last, to suggest as such would be a logical redundancy and also would be butchering the original Greek with which this was written. Also note here, the part that says “he that liveth, and was dead, and behold, I am alive for evermore..” If you had any doubt whatsoever of who was speaking right there, that should remove it completely in my mind. He was dead, but then rose from the dead, and now is alive forever, and he calls himself by both the Divine Name and the divine title ‘The First and The Last’. However, if more evidence is required, I submit for your approval the following, again, from Revelation. I Jesus have sent mine angel to testify unto you these things in the churches. I am the root and the offspring of David, [and] the bright and morning star. He which testifieth these things saith, Surely I come quickly. Amen. Even so, come, Lord Jesus. Explain to me exactly, how someone can be both the root, and the offspring of someone? How exactly does that work out from a strictly natural point? The only kind of person I can think of who could make such a claim would be the same person who had the ‘huspha’ to declare boldly “Before Abraham was, I AM”….. Here we have a startling revelation of a vital aspect of the Holy Spirit. Only a person with a personality can be “grieved”… We also see here that this Holy Spirit is none other than the Spirit of God.. the same spirit which we see hovering over the waters in Genesis chapter 1… The only way to deny this in my mind is to insist that God has more than one spirit, which I cannot see being possible. Given in you have what many (myself included) see as a reference to the Holy Spirit being called “the seven spirits before God’s throne” but in reality, what that is ultimately referring to in my opinion is the same seven-fold Holy Spirit from (since 7 is the number of God, and 6 the number of man ironically in Biblical numerology) speaking of seven specific jobs that said Spirit performs. All this taken with the number seven is then in turn another argument that this Spirit of God, is in actuality, God himself. But I will leave that aside, as the following pretty much renders all of that speculation obsolete. But Peter said, Ananias, why hath Satan filled thine heart to lie to the Holy Ghost, and to keep back [part] of the price of the land? Whiles it remained, was it not thine own? and after it was sold, was it not in thine own power? why hast thou conceived this thing in thine heart? thou hast not lied unto men, but unto God. You cannot lie to a table, to a dog, or any kind of inanimate or impersonal object or entity. You can only lie to a cognizant personality (unless you have some serious, serious issues… beyond just being a liar of course). Here Peter asks point blank “why did you lie to the Holy Spirit (or Ghost rather)…. and later adds “You have not, lied to man, but to GOD”… So, apparently Peter at least understands the Holy Spirit as an entity that is not just connected to God, but who somehow is God. But the real grand finale is yet to come. As they ministered to the Lord, and fasted, the Holy Ghost said, Separate me Barnabas and Saul for the work whereunto I have called them. And when they had fasted and prayed, and laid [their] hands on them, they sent [them] away. So they, being sent forth by the Holy Ghost, departed unto Seleucia; and from thence they sailed to Cyprus. This seals the deal for me. Right here you have a direct quote from the Holy Spirit Himself. Impersonal forces or entities devoid of personality do not have the ability to speak. Here you have not only a direct quote of this Person, but one in which He, and I emphasize He, not the Father, not the Son, but The Holy Spirit himself has personally declared that it was Him who has called Barnabas and Saul to their respective tasks here in this chapter. So there, to my satisfaction anyway, I think I have demonstrated that the Bible does speak of three individual Persons, not three impersonal entities smudged together to perform a series of tasks, but three literal Persons, all of whom are said in Holy Scripture to be GOD and yet according to 1st Timothy there is only one God which leads me to the conclusion stated above in the opening paragraphs. Again, this does not explain or attempt to explain the physics of how such a union is possible, or even how a human mind can wrap itself around such a concept as the Godhead. But I don’t believe the Bible has called us to understand the Trinity in explicit intricate detail anymore than we can understand the complicated degree of design in the universe without spending years upon years studying it with specialized training and insight.. Instead, it is my conclusion that we are only called to take God at His Word, even when our mortal minds cannot fully comprehend the message He has revealed to us about Himself, which here, is that He is one God, a solid singularity, but that He is also comprised of three individual personages, that being Father, Son, and Spirit. Finally, in response to a tired argument that gets brought up whenever the Trinity is mentioned… The doctrine of the Trinity does not suggest that “1 + 1 + 1 = 1” rather it suggests that “1 x 1 x 1 = 1” which is an equation in which there is no logical error or contradiction whatsoever. Also if you look at one of the simplest of all God’s creations, and according to the Bible, one of the earliest of them as well, that being water, you will note that it is entirely possible for said water to exist, in three different states (as a solid, a liquid, and a gas), at the same time, without there being any contradiction, difference, or disharmony whatsoever within the fundamental make-up of the actual H20 itself… So I conclude, that if an element as fundamentally simple as water can posses such a capacity to exist in three different states, then how much more so can the Being who created it in the first place as well as everything else we see (and don’t see) around us in the entire Universe have the exact same capacity… only to a far greater degree of complexity in His own fundamental nature? As always, thank you for reading, and may God bless you.